Greek: alla lempsesthe (2PFMI) dunamin epelthontos (AAPNSG) tou hagiou pneumatos eph' humas, kai esesthe (2PFMI) mou martures en te Ierousalem kai [en] pase te Ioudaia kai Samareia kai eos eschatou tes ges. ICB: But the Holy Spirit will come to you. Then you will receive power. You will be my witnesses--in Jerusalem, in all of Judea, in Samaria, and in every part of the world." Mace NT: but ye shall receive the influence of the holy spirit, which will descend upon you: and ye shall be witnesses for me, in Jerusalem, in all Judea, and in Samaria, and to the remotest part of the earth. NIV: But you will receive power when the Holy Spirit comes on you; and you will be my witnesses in Jerusalem, and in all Judea and Samaria, and to the ends of the earth." NKJV: "But you shall receive power when the Holy Spirit has come upon you; and you shall be witnesses to Me in Jerusalem, and in all Judea and Samaria, and to the end of the earth." TLB: But when the Holy Spirit has come upon you, you will receive power to testify about me with great effect, to the people in Jerusalem, throughout Judea, in Samaria, and to the ends of the earth, about my death and resurrection." Weymouth: and yet you will receive power when the Holy Spirit has come upon you, and you will be my witnesses in Jerusalem and in all Judaea and Samaria and to the remotest parts of the earth." Wuest: But you shall receive power of the kind which God has and exerts after the Holy Spirit has come upon you. And you shall be those who testify of what they have seen and experienced, my witnesses, both in Jerusalem and in all Judaea and in Samaria and to the end of the earth. THE MODERN CHURCH'S GREATEST NEED! Acts 1:8 is the key that unlocks the door of Acts and the gates of Christian history. Acts 1:8 represents the last known words of Jesus during His earthly ministry. Verse 9 indicates these are the Lord’s final words before being “taken up.” Luke 24:50-53 says Jesus ascended to heaven while blessing His disciples, but His words of blessings aren’t given. Acts 1:8 are His final words as they were recorded for us. Shouldn’t His last command be our first concern? Acts 1:8 represents the passing of the baton between the Son and the Spirit regarding the divine mission on earth. Jesus indicated in the upper room discourse (John 13-17) that in His physical body He would return to heaven. His presence here would be replaced, so to speak, by the Holy Spirit; and He told the disciples in Luke 24 to tarry in Jerusalem until the Spirit arrived. In Acts 2 we have this arrival, the unleashing of the Holy Spirit upon the church. The book of Acts (and all subsequent Christian history) is the story of what Jesus Christ is continuing to do (see v. 1) on earth through His Spirit working in His church. Acts 1:8 provides the table of contents for the book of Acts. In reading through Acts, it becomes clear that chapters 1-7 describe the gospel’s penetrating Jerusalem; chapters 8-12, Judea and Samaria; and chapters 13-18, the ends of the earth, exactly as outlined in Acts 1:8. A W Tozer - If God were to take the Holy Spirit out of this world, much of what we’re doing in our churches would go right on and nobody would know the difference!...I do not believe in a repetition of Pentecost, but I do believe in a perpetuation of Pentecost—and there is a vast difference between the two. Robert Neighbour on the need for the Spirit - Unless saints know their anointing, they are helpless as babes in doing the will of God. The work of God can only be made powerful through the Spirit of God. "Ye shall receive power, the Holy Ghost coming upon you," was the promise of the Father. Alas, how many churches there are to-day whose only knowledge of the Holy Spirit, is a theoretical knowledge. From the pastor down through the whole membership, there seems to be no Spirit-endued witnesses to the faith. It certainly pays to halt the work until there is a conscious manifestation of the Spirit's working. Service rendered in the energy of the flesh is a fruitless service. The minister himself needs far more than the best that a theological training can give him; he needs far more than oratorical gifts; far more than literary accomplishments; he needs to have his heart and lips touched with a live coal from off God's altar. The young man or young woman who is in preparation for any phase of Christian work, needs more than schools and colleges can impart. In order to be used of God, one must be set on fire by the Spirit of God. "Power belongeth unto God." (Psalm 62:11KJV) It is "by My Spirit, saith the Lord of Hosts." (Zechariah 4:6) Stephen was a mighty witness, because he was a man full "of faith and power." (Acts 6:8) The early Church was told to look out from among themselves, men "filled with the Holy Ghost." (Acts 2:4, 4:8, 4:31, 9:17, 13:9) Our churches and our mission stations at home and abroad need to demand as their first prerequisite, that those who serve them are people who have heard of the Holy Ghost and who have been "endued with power from on high." (Luke 24:49) The factory may be splendidly equipped, but of what use is it all, unless there is power to turn the wheels? The train may stand on the track with every comfort that modern ingenuity can provide, but of what value is it unless the fire is under the boiler, and the power is at hand to run the train? Vance Havner - Satan has scored a point in making us so afraid of extremism about the Holy Spirit—which abounds indeed—that we may miss the true in our fear of the false. We can be so wary of getting out on a limb that we never go up the tree! John Murray- If Pentecost is not repeated, neither is it retracted. This is the era of the Holy Spirit. John Stott - Before Christ sent the church into the world, he sent the Spirit into the church. The same order must be observed today. Comment: The Bible of course is not like nature, nor is it like any other book, for as believers we possess within ourselves (1Cor 3:16, 1Cor 6:19-note) the Holly Spirit, the Author and "Decipherer" of the Book. And so as we prayerfully, humbly, thoughtfully, meditatively, yea even as a little child (Mt 18:3-4) interrogate the "living and active" (Heb 4:12-note) Word of Truth (Ps 119:43-note, 2Co 6:7, Col 1:5-note, 2Ti 2:15-note, Jas 1:18-note, see also Jn 8:31,32, 17:17), our Teacher, the Spirit, in some very real (albeit to me still mysterious) way interacts with us, illuminating the inspired Word and leading us into all Truth, even as Jesus promised (John 16:13, cp Jn 14:16, 26, 15:26, 16:7 1Jn 2:20,27). The more you actively (in contrast to passively) engage the text by practicing this discipline (and it does take practice) of Spirit led interrogation, the more relevant will be your questions, and the richer your rewards as the Spirit illuminates God's Word to the "eyes of your heart" (Eph 1:18-note) allowing you to glean wonderful insights of vital Truth by which we are sanctified (set apart from the profane world and for the Holy One's use, Jn 17:17, cp 2Ti 2:21-note). Comment: The apostles were looking for the restoration of "the kingdom to Israel," an observation which refutes many today who say that God is finished with Israel and that the promises to Israel have been transferred to the Church. Notice that Jesus did not "correct" their "aberrant eschatological" view! Clearly, God is not finished with Israel (Israel's truly miraculous nationhood granted in May, 1947 should be evidence enough to convince even the most skeptical observer!) will restore the kingdom to Israel in the Millennium (numerous passages from the OT, not just from Revelation 20!) (see also Millennium 1 and Millennium 2) (See related studies on Daniel 9:24-27 [Daniel 9:24; Daniel 9:25; Daniel 9:26; Daniel 9:27]) The timing of the messianic, millennial kingdom on earth is unrevealed (Mt 24:36, 42). To reiterate, if Jesus had not intended such a kingdom, surely He would have corrected this erroneous notion in His disciples at this point. SO WHAT IS THE CONTRAST? In a word, Jesus calls the apostles to focus not on the future, but the present. Instead of discussing their future kingdom, Jesus sharply draws their attention to their present responsibility. Jesus alludes to His previous mention of baptism with the Holy Spirit (Acts 1:4-5) and now associates this baptism with the receipt of supernatural power which was necessary for them to be His witnesses. You will receive - What does this tell us? This was something future. This prophetic promise (Acts 1:4, Lk 24:49) was fulfilled on Pentecost (Acts 2:1-4). What will they receive? Power, not so much that it is a gift from the Holy Spirit; but that the power is intimately associated with the presence of the Holy Spirit. What was the great need of the first church? Power from the Holy Spirit! What is the great need of the church today? Power from the Holy Spirit! Dear reader, may God be pleased to pour to overflowing the supernatural power of His Spirit into your life and your local body of believers for the sake of His Kingdom and His glory. Amen. the mandate to witness that stands as the theme for the whole of Acts is explicitly set out. It comes as a direct commission from Jesus Himself—in fact, as Jesus’ last word before His ascension and, therefore, as one that is final and conclusive. All that follows in Acts is shown to be the result of Jesus’ own intent and the fulfillment of His express word. This commission lays an obligation on all Christians and comes to us as a gift with a promise. There are two NT words that convey the idea of power, exousia and dunamis, and it is the latter which is used by Luke in Acts 1:8. However, these two words are related in one sense, for the One Who promises the power (dunamis) is the very One to Whom all authority (exousia = "the right and the might") "in heaven and on earth" has been granted (Mt 28:18)! It follows that His promise of power can be fully trusted because He has full authority to make such an incredible proclamation - natural men and women will receive supernatural power to be His witnesses and by their witness will be privileged to witness the great miracle (based upon the greatest miracle, the Resurrection of Christ) of rebirth of a dead spirit, the creation of new life, eternal life in another human soul. Let me encourage you to study the Biblical truths about power in the following section, and as you study this truth, may our Father be pleased to generate in your inner being a deep, abiding hunger and thirst to experience the continual fullness of the Holy Spirit and the power He provides to live the supernatural life as a dynamic witness for Jesus Christ and His Gospel of grace. Amen. For (term of explanation = see context = Ro 1:15-note) I am not ashamed of the Gospel, for (term of explanation = e.g., Ask "Why not?") it (What?) is the power of God for salvation to everyone who believes (present tense), to the Jew first and also to the Greek. (Ro 1:16-note). The same power that brought Christ back from the dead is operative within those who are Christ's. Jesus be Jesus in me, no longer me but Thee. Resurrection power fill me this hour. Acts 1:8 but you will receive power (dunamis) when the Holy Spirit has come upon you; and you shall be My witnesses both in Jerusalem, and in all Judea and Samaria, and even to the remotest part of the earth." Acts 3:12 But when Peter saw this, he replied to the people, "Men of Israel, why are you amazed at this, or why do you gaze at us, as if by our own power (dunamis) or piety we had made him walk (Context = Acts 3:1-6, 7, 8? Comment: Peter's implication is that it is not his "power" (dunamis) but it is God's power, supernatural power by which the miracles have been performed. Acts 4:7 When they had placed them in the center, they began to inquire, "By what power (dunamis), or in what name, have you done this (Context = healed the lame man - see preceding use of power)?" Acts 4:31 (For Context) And when they had prayed, the place where they had gathered together was shaken, and they were all filled with the Holy Spirit, and began to speak the word of God with boldness (What was the effect of filling? Speaking the Word of God, not their words, and doing so with boldness, clear evidence of the power Jesus had promised would be associated with the coming of the Holy Spirit).... Acts 4:33 And with great power (dunamis) the apostles were giving testimony (marturion from martus) to the resurrection of the Lord Jesus, and abundant grace was upon them all. Comment: Observe how the apostles obeyed Acts 1:8 and God blessed their obedience. Will He do any less for any of His disciples who obey His charge to be "My witness" wherever He has placed us? I think not! Acts 6:8 And Stephen, full of grace and power (dunamis), was performing great wonders and signs among the people. Comment: Be careful when you read a passage in isolation, lest you arrive an incorrect interpretation. If possible take time to examine the context -- you will often be pleasantly rewarded with wonderful insights! In the present passage, we learn from the context that Stephen was "a man full of faith and of the Holy Spirit" (Acts 6:5) and here in verse 8 we see he is full of grace and power. Do you think there is any association? The answer is obviously "yes" and so once again we observe the intimate association of the presence (and fullness) of the Holy Spirit and power. Notice that spiritual opposition arose but "they were unable to cope with the wisdom and the Spirit with which he (Stephen) was speaking." (Acts 6:10) Why? Because Stephen's power was not human but divine! The same power every believer has access when filled with the Holy Spirit (cp Eph 5:18). Observe the Spirit empowered boldness that prompted Stephen to tell the Jewish audience "You men who are stiff-necked and uncircumcised in heart and ears are always resisting the Holy Spirit; you are doing just as your fathers did. Which one of the prophets did your fathers not persecute? And they killed those who had previously announced the coming of the Righteous One, whose betrayers and murderers you have now become; " (Acts 7:51, 52). And how did they respond? "They were cut to the quick and they began gnashing their teeth at him" (Acts 7:54) And how did Stephen respond? "But being full of the Holy Spirit, he gazed intently into heaven and saw the glory of God, and Jesus standing at the right hand of God 56 and he said, "Behold, I see the heavens opened up and the Son of Man standing at the right hand of God." (Acts 7:55-56) And observe his supernatural power to forgive the very ones who were stoning him declaring "Lord, do not hold this sin against them!" And having said this, he fell asleep." (Acts 7:60) Stephen had received power and the fullness of the Spirit to be a witness for Jesus, for a man named Saul watched Stephen's supernatural life and death and later became Paul, the greatest apostle of the New Testament. That's what Acts 1:8 is about! As a side exercise study the passages in Acts that describe filling or fullness of the Spirit (remember to observe the context) - Acts 2:4, Acts 4:8, Acts 4:31, 33, Acts 6:3, 5, 8, 7:55, Acts 9:17, Acts 11:24 (note the impact of his witness), Acts 13:9 (contrast Acts 13:9), Acts 13:52 (compare Ro 15:13). Acts 8:10 and they all, from smallest to greatest, were giving attention to him, saying, "This man is what is called the Great Power (dunamis) of God." Acts 8:13 Even Simon himself believed; and after being baptized, he continued on with Philip, and as he observed signs and great miracles taking place, he was constantly amazed. Acts 10:38 "You know of Jesus of Nazareth, how God anointed Him with the Holy Spirit and with power (dunamis), and how He went about doing good and healing all who were oppressed by the devil, for God was with Him. Comment: Beloved, do not miss the intimate association of the presence of the Spirit and power in the life and ministry of our Lord Jesus Christ. As will be discussed more fully below, Jesus is our great example for dynamic, supernatural ministry. If He needed the Spirit and the power, how much greater is our need? Why do we so often attempt to minister in our natural ability rather than relying upon God's provision of power? Romans 15:18 For I will not presume to speak of anything except what Christ has accomplished through me, resulting in the obedience of the Gentiles by word and deed, 19 in the power (dunamis) of signs and wonders, in the power (dunamis) of the Spirit; so that from Jerusalem and round about as far as Illyricum I have fully preached the gospel of Christ. Comment: Notice the phrase "what Christ has accomplished through me." How did Christ accomplish this spread of the Gospel? Acts 1:8 says that being Christ's witness requires the power which is associated with the Holy Spirit, the Spirit of Jesus (Acts 16:7), the Spirit of Christ (Ro 8:9-note). Note also that Illyricum was a province of the Roman Empire, lying East and Northeast of the Adriatic Sea. Paul is describing the witness of Jesus being spread to the remotest part of the earth. 1 Corinthians 2:4 and my message and my preaching were not in persuasive words of wisdom, but in demonstration of the Spirit and of power (dunamis), 5 so that your faith would not rest on the wisdom of men, but on the power (dunamis) of God. 1 Thessalonians 1:5 for our Gospel did not come to you in word only, but also in power (dunamis) and in the Holy Spirit and with full conviction; just as you know what kind of men we proved to be among you for your sake. Comment: While this passage does not mention the Holy Spirit, the phrase "the power that works within us" is clearly a manifestation of the Spirit Who dwells within us and through Whom God works. Colossians 1:29 For this purpose also I labor, striving according to His power (dunamis), which mightily works within me. Comment: As in Ephesians 3:20, the power that works within us is a manifestation of the Spirit of Christ Who lives within us, strengthening us in our inner man, enabling us to do supernaturally what we could never do naturally. Dunamis (dynamis) is the source of our English words dynamic, dynamo, and dynamite. Ponder the meanings of these English words as you meditate on Acts 1:8 and how this truth should impact our witness to a world spiritually dead in "trespasses and sins" (Eph 2:1-note). Dynamic is an adjective describing one as "characterized by constant activity," "marked by usually continuous and productive activity or change," "energetic". Synonyms = "alive, functioning, live, operative, running, working." "Many a person who thinks he’s a human dynamo is probably more like an electric fan." As a noun dynamic describes "a force that stimulates change." Would you describe our witness as dynamic? Dynamo is "a machine for converting mechanical energy into electrical energy by rotating conducting coils in a magnetic field," "an extremely energetic person,"
Dynamite is a well known explosive, which when used figuratively describes "one that has a powerful effect". And so we have "dynamic" (a powerful person or movement), "dynamo" (a power-producing machine), and "dynamite" (an extremely powerful explosive). These English words suggest (1) adequate power; (2) personal power; (3) perpetual power. Ponder these meanings as you contemplate how they might apply to the phrase "my witnesses". We have no power from God unless we live in the persuasion that we have none of our own. Comment: I would add the corollary that pride (call it self sufficiency or self reliance if you wish, but it's still the same sin in different "dress") impedes the flow of God's power. Power in the Greek is dunamis, of which our word "dynamite." is almost a transliteration, and this expresses well the greatness of the power to upheave the obstacles in their way; although the power bestowed was in its action more like that of the sun, which is infinitely greater than all the explosives in the world. Spiritual power may be felt rather than described or analyzed. It resides in or it permeates a man’s whole circle of activities; it cannot be localized, it cannot be identified exclusively with one of them. It is an unearthly beauty, whose native home is in a higher world, yet which tarries among men from age to age, since the time when the Son of God left us His example (1Pe 2:21), and gave us His Spirit. It is nothing else than His spiritual presence, mantling upon His servants; they live in Him; they lose in Him something of their proper personality; they are absorbed into, they are transfigured by, a Life altogether higher than their own; His voice blends with theirs, His eye seems to lighten theirs with its sweetness and its penetration; His hand gives gentleness and decision to their acts; His heart communicates a ray of its Divine charity to their life of narrower and more stagnant affection; His soul commingles with theirs, and their life of thought, and feeling, and resolve is irradiated and braced by His. Weymouth translation: For no promise from God will be impossible of fulfilment. As Peter declares God's "divine power (dunamis) has granted (perfect tense = an enduring gift) to us everything pertaining to life and godliness" (2Pe 1:3-note). In summary, believers have everything necessary to be His witnesses - His Word of power, the inherent supernatural power of the Gospel message, and the miracle working power of His indwelling Spirit! What else do we need? Luke 9:1 And He (Jesus) called the twelve (disciples) together, and gave them power (it is a Gift even as here in Acts 1:8!) and authority (exousia = the right and the might) over all the demons, and to heal diseases. Comment: Notice that even before the coming of the Holy Spirit at Pentecost, it was necessary for "Kingdom workers" to be enabled by Divine Dunamis! Luke 10:19 "Behold, I have given you authority (exousia = the right and the might) to tread upon serpents and scorpions, and over all the power of the enemy, and nothing shall injure you. Comment: Notice that in context Jesus was sending out the seventy-two in twos to minister in His name and they needed His divine authority and might for ministry! Beloved, if this was their need then, is it not our great need of the hour now?! Luke 24:49 (Context: Lk 24:45-46, 47-48, 50-51)"And behold, I am sending forth the promise of My Father upon you (the 11 disciples/apostles); but (strong contrast) you are to stay in the city until (Note: Not "if" but "until" - see expressions of time) you are clothed with power (dunamis) from on high." Old Testament examples of Spirit "Upon" Someone: Moses = Nu 11:16, 17, 25, 26 (!!! ), Nu 24:2, Jdg 3:9, 10, Jdg 6:34, Jdg 11:29, Jdg 14:5, 6, 19, 15:14, Saul = 1Sa 10:6, 10, 11:6 (Contrast 1Sa 18:10), David = 1Sa 16:13, 1Sa 19:20, 1Sa 19:23 (Saul), 1Chr 12:18, 2Chr 20:14, Isa 32:15 (to be fully fulfilled at the inception of the Millennium - Zech 12:10, Ezek 37:12-14, cp Ro 11:26), Isa 42:1, 59:21, Isa 61:1 (Lk 4:18, cp Mt 3:16, 12:18), Ezek 11:5, 37:1. Acts 1:4 "And gathering them together, He commanded them not to leave Jerusalem, but to wait for what the Father had promised, "Which," He said," you heard of from Me." Comment: The promise of the Father was the Person of the Spirit, the Power of the Holy Spirit and the Plan of the Holy Spirit (Jerusalem, etc). power is the grand indispensable of Christian witness. A man may be highly talented, intensively trained, and widely experienced, but without spiritual power he is ineffective. On the other hand, a man may be uneducated, unattractive, and unrefined, yet let him be endued with the power of the Holy Spirit and the world will turn out to see him burn for God. The fearful disciples needed power for witnessing, holy boldness for preaching the gospel. Comment: I think immediately of Dwight L. Moody, a layman who never went to seminary and yet by some accounts preached powerfully to over 100 million people in a day time when travel was difficult. C H Spurgeon is another man who never went to seminary, but whom God used mightily. They were greatly used by God because they relied on the Spirit's power. The need of the hour is power! But beware! While there is genuine Spirit given power based on truth, there is also a subtle counterfeit power based on error. There is a crying need for Spirit given discernment of Scripture saturated saints, men and women who have a steady diet of "solid food" which "is for the mature, who because of practice have their senses trained (gumnazo - rigorous spiritual exercise involving the practice of serious study of the Word.) to discern good and evil." (Hebrews 5:14-note). I know of no more efficient way of cultivating this greatly needed quality of discernment than by learning to study the Bible Inductively. One man may have "zeal without knowledge," while another may have knowledge without zeal. If I could have only the one, I believe I should choose the first; but, with an open Bible, no one need be without knowledge of God's will and purpose; and the object of this book is to help others to know the source of true power, that both their zeal and their knowledge may be of increased service in the Master's work. Paul says, "all Scripture is given by inspiration of God, and is profitable;" but I believe one portion, and that the subject of this book, has been too much overlooked, as though it were not practical, and the result is lack of power in testimony and work. If we would work, "not as one that beats the air," (1Cor 9:26) but to some definite purpose, we must have this power from on high. Without this power, our work will be drudgery. With it, it becomes a joyful task, a refreshing service. May God make this book a blessing to many. This is my prayer. D. L. MOODY. NORTHFIELD, MASS., May 1st, 1881. ....Now I tell you when the Spirit of God is on us for service, resting upon us, we are anointed, and then we can do great things....I would like to see some one just full of living water; so full that they couldn't contain it; that they would have to go out and publish the Gospel of the grace of God. When a man gets so full that he can't hold any more, then he is just ready for God's service. It was the custom of the Roman emperors, at their triumphal entrance, to cast new coins among the multitudes; so doth Christ (Acts 1:8), in His triumphal ascension into heaven (Acts 1:9), throw the greatest gifts for the good of men that were ever given.--Thomas Goodwin. When - Not "if" but "when" - His coming was a certainty. His power was assured. All they had to do was tarry, to wait. The Holy Spirit - Not an "it", nor a "thing", nor a spiritual "effect." No! He is a Person, the Third Person of the Godhead. He is One Jesus asked for from the Father. He the one the Father promised to send. He is the One Who would accompany the New Heart of the New Covenant. He is the One associated with power, supernatural power, miracle working power, necessary power, sufficient power, power to be Christ's witnesses. John 14:16 "And I will ask the Father, and He will give you another Helper, that He may be with you forever; 17 that is the Spirit of truth, whom the world cannot receive, because it does not behold Him or know Him, but you know Him because He abides with you, and will be in you. 18 "I will not leave you as orphans; I will come to you." Comment: Observe (1) the indwelling of the Spirit is forever, which implies He will be in us in eternity future. (2) the promise that the Spirit would one day dwell "in" them (3) Jesus saying "I will come to you" but how? Surely a reference to the Spirit of Christ Who came at Pentecost and Who now comes to indwell every believer. John 14:25 "These things I have spoken to you, while abiding with you. 26 "But the Helper, the Holy Spirit, whom the Father will send in My name, He will teach you all things, and bring to your remembrance all that I said to you. John 15:26 "When the Helper comes, whom I will send to you from the Father, that is the Spirit of truth, who proceeds from the Father, He will bear witness of Me, 27 and you will bear witness (martureo) also, because you have been with Me from the beginning. John 16:7 "But I tell you the truth, it is to your advantage that I go away; for if I do not go away, the Helper shall not come to you; but if I go, I will send Him to you. 8 "And He, when He comes, will convict the world concerning sin, and righteousness, and judgment; 9 concerning sin, because they do not believe in Me; 10 and concerning righteousness, because I go to the Father, and you no longer behold Me; 11 and concerning judgment, because the ruler of this world has been judged. 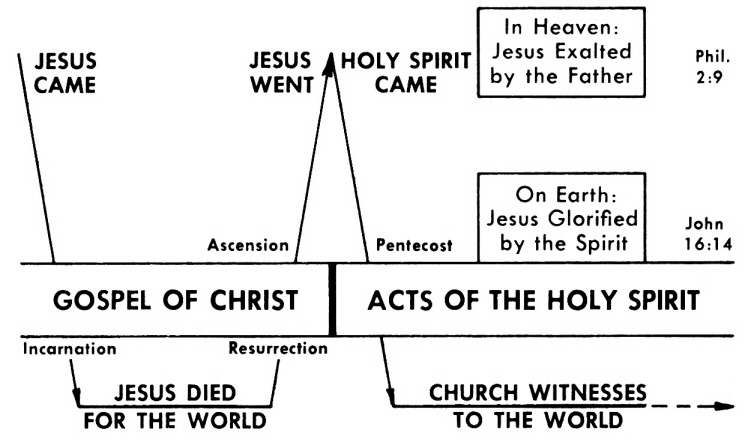 In the diagram (click to enlarge) notice that when Jesus ascended, the Spirit descended. However, there is more to the story as Paul Harvey used to say! As will be explained below, the Gospels teach us that Jesus, fully God, but also fully Man, witnessed in the power of the Holy Spirit and in so doing left His followers the perfect example to follow as His witnesses to the world! Comment: John's exhortation begs the question "How did Jesus conduct Himself during His ministry on earth?" And specifically what was the source of His power for this walk? Matthew 3:16-17, 4:1 (cp Mk 1:10, Lk 3:22, Jn 1:32, 33, 34) And after being baptized, Jesus went up immediately from the water; and behold, the heavens were opened, and he saw the Spirit of God descending as a dove, and coming upon Him (come = erchomai + upon = epi. Compare "comes upon" = eperchomai here in Acts 1:8),17 and behold, a voice out of the heavens, saying, "This is My beloved Son, in whom I am well-pleased." Then Jesus was led up by the Spirit into the wilderness to be tempted by the devil. What did Jesus mean? The ESV Study Bible has this excellent answer... “Greater works” will be possible because of the power of the Holy Spirit Who would be sent after Jesus goes to the Father (John 16:7; also John 7:39; 14:16, 26). These “greater works” include evangelism, teaching, and deeds of mercy and compassion—in short, the entire ministry of the Church to the entire world, beginning from Pentecost (Acts 2:1-2, 3-4). (E.g., on the day of Pentecost alone, more believers were added to Jesus’ followers than during his entire earthly ministry up to that time; cf. Acts 2:41.) These works are “greater” not because they are more amazing miracles but because they will be greater in their worldwide scope and will result in the transformation of individual lives and of whole cultures and societies. Comment: Observe that last phrase "God was with Him." Notice that it is introduced by a ("for"), which explains how Jesus was able to carry on ministry. This is a mystery to me, for Jesus could have chosen to minister in His own power, but He did not. He chose to empty Himself and become a bondservant of the Most High God and to leave you and I the perfect pattern for powerful ministry "for God was with Him." In summary from the preceding passages, it is clear that Jesus, although fully God, emptied Himself of His divine prerogatives (cp Php 2:6-7-note) and carried out His ministry in the power of the Holy Spirit, leaving us an example to follow His steps, an example to be imitated even as Paul imitated Jesus. To be sure, there are some supernatural events in Jesus' ministry that cannot be replicated (in my opinion) by believers (turning water to wine, feeding 5000, etc), but the basic premise holds that Jesus showed us that a perfect Man could carry out a supernatural ministry in the supernatural power of the Holy Spirit. And so here in Acts, at the beginning of the Church Age, Jesus is explaining to His apostles (and by way of application to all believers) that they cannot be His witnesses in their own strength but only in the power of the Holy Spirit! E. M. Bounds once said "The Holy Ghost does not flow through methods but through men. He does not come on machinery but on men. He does not anoint plans but men—men of prayer." A W Tozer commenting on “Ye shall receive power.” explained that "By those words our Lord raised the expectation of His disciples and taught them to look forward to the coming of a supernatural potency into their natures from a source outside of themselves. It was to be something previously unknown to them, but suddenly to come upon them from another world. It was to be nothing less than God Himself entering into them with the purpose of ultimately reproducing His own likeness within them.... This power is to come upon powerless men as a gentle but resistless invasion from another world bringing a moral potency infinitely beyond anything that might be stirred up from within. This power is sufficient; no additional help is needed, no auxiliary source of spiritual energy....Power came upon the Church, such power as had never been released into human nature before (with the lone exception of that mighty anointing which came upon Christ by the waters of Jordan). That power, still active in the Church, has enabled her to exist for nearly twenty centuries." Has come upon you (1904) (eperchomai from epi = upon + erchomai = come) means literally to come upon or over a person or place. To draw near which can refer to people, events or time as shown in the nine NT uses. To come upon in the sense of arriving (Acts 14:19). To come upon in the sense of something happening or occurring (Acts 8:24) Eperchomai is used by Luke twice to describe the Holy Spirit coming upon individuals (Mary Lk 1:35, apostles Acts 1:8). Luke 21:26 uses eperchomai in a prophetic sense of coming global and heavenly catastrophic events. Luke 11:22 uses eperchomai to signify coming upon in a hostile sense, so as to assault someone. Epi and erchomai the root words of eperchomai are used in the Lxx translation of Isaiah 32:15 where the Greek can be rendered "until the Spirit has come (erchomai) upon (epi) you from on high." The context is the prophet speaking of the desolation of Israel which will continue until "the Spirit is poured out on us from on high." The point is that in Acts, the fulfillment of the promise of the Spirit is a sign that marks God's end-time restoration of Israel. Acts 1:8 however envisions a worldwide mission. The complete fulfillment of Isaiah 32:15 (Israel's restoration, specifically the believing remnant) awaits the completion of God's worldwide mission to both Jews and Gentiles. Has come is in the aorist tense which indicates the Spirit's coming is to be a definite historical event, not a continuous coming. He will come on believers at a given point in time, specifically on the day of Pentecost. It is important to clarify that since the time of the book of Acts, every believer has been "baptized" (in the sense of identified with) the Holy Spirit at the time of their new birth. Conversely, if a person does not possess the Holy Spirit, they are not born again. (See Romans 8:9). Baptism with the Spirit is a one time event, while filling with the Spirit is a repeated experience. Our goal as followers of Christ should be to continually seek to obey Paul's command to "be filled with the Spirit" (Ephesians 5:18). When He fills us, He will control us and empower us. Is this mysterious? It is to me, but it is the great need of every blood bought, heaven bound believer until the day they see the Lord face to face! No one may ask a believer whether he has been baptized with the Spirit. The very fact that a man is in the body of Christ demonstrates that he has been baptized with the Spirit, for there is no other way of entering the body. Except in Eph. 2:7 and Jas 5:1 the word occurs in the NT only in Luke and Acts. Figuratively it means coming on someone, e.g., the stronger on the weaker in Lk. 11:22. The Holy Spirit as the power of God comes on Mary in Lk. 1:35 and on the disciples in Acts 1:8. Disasters will come at the end, according to Lk. 21:26, 35 (cf. Jas 5:1). But in Eph. 2:7 the ineffable generosity of divine grace will be shown to coming ages. Luke 1:35 The angel answered and said to her, "The Holy Spirit will come upon you (the virgin Mary), and the power (dunamis) of the Most High will overshadow you; and for that reason the holy Child shall be called the Son of God. Luke 11:22 "But when someone stronger than he attacks (Literally - comes upon) him and overpowers him, he takes away from him all his armor on which he had relied and distributes his plunder. Luke 21:26 men fainting from fear and the expectation of the things which are coming upon the world; for the powers of the heavens will be shaken. NET Note comment: An allusion to Isa 34:4. The heavens were seen as the abode of heavenly forces, so their shaking indicates distress in the spiritual realm. Although some take the powers as a reference to bodies in the heavens (like stars and planets, “the heavenly bodies,” NIV) this is not as likely. Comment: I agree with the NET note that the powers that are to be shaken are the demonic powers who will indeed be devastated by the return of the Lord Jesus Christ. Acts 8:24 But Simon answered and said, "Pray to the Lord for me yourselves, so that nothing of what you have said may come upon me." Comment: The sad commentary of a man who came close to salvation but never manifested genuine belief. See John MacArthur's back to back sermons on this sad scenario - Acts 8:9-24 The Faith That Does Not Save and Acts 8:25-40 The Faith That Does Save . Comment: The reference is to the prophecy of Habakkuk that Judah would fall to Babylon. Acts 13:41 goes on to quote Hab 1:4 as a solemn warning of divine judgment to those who might be tempted to refuse God’s great offer of present salvation. To reject or ignore the Good News guarantees (eternally) frightening consequences. Acts 14:19 But Jews came from Antioch and Iconium, and having won over the crowds, they stoned Paul and dragged him out of the city, supposing him to be dead. Comment: The resistance of the enemies of the Gospel is seen in the fact that these Jews came from 100 miles to try to destroy Paul and his Gospel. Ephesians 2:7-note so that (This term always expresses purpose - stop and ask what purpose, why, when, who affected, etc) in the ages to come He might show the surpassing riches of His grace in kindness toward us in Christ Jesus. Comment: This is one of my favorite verses for it tells us (1) there will be more than one age to come (ages is plural), at least the millennium followed by the New Heaven and New Earth (? more - we don't know) and (2) the miracle of transforming grace will be the subject of eternal revelation so that "God will be unveiling to the heavenly throng what it cost Him to send His Son to this jungle of sin, and what it cost the Lord Jesus to bear our sins at the cross. It is a subject that will never be exhausted." (MacDonald). Comment: Here eperchomai is used like Luke 21:26 in the context of judgment which is coming upon the disobedient, those who steadfast refuse God's gracious offer of the free gift of salvation by repentance and faith (Mark 1:15). The use of the present tense pictures these miseries as continually on their way! No excuses, and no escape, except in Christ! TDNT summarizes the following 82 Septuagint (Lxx) uses "The LXX uses the word with reference to things, events, conditions, etc. that bring evils, or, less frequently, blessings." If it were possible to put the Holy Spirit into a textbook of pharmacology I would put him under the stimulants, for that is where he belongs. Or else we serve in vain. Until that power we gain. You shall be - When? In the future. Note Jesus does not say "you shall do" but "you shall be." There's an eternity of difference between "being" and "doing." Too many in the church accentuate the "doing" at the expense of the "being" and the result is (supernatural) power failure! As A J Gordon so pithily put it - Before Pentecost the disciples found it hard to do easy things; after Pentecost they found it easy to do hard things. My witnesses - There are two possible meanings -- The first sense is witnesses about Jesus (objective genitive) giving testimony of His life, death and resurrection. The second sense is witnesses of Jesus (possessive genitive) as those who belong to Him and are His feet on the ground so to speak. Luke 24:44-48 (cp also Acts 4:33 and Acts 10:42) would tend to favor that the intended meaning is witnesses who help establish the truthfulness of Jesus life, death, burial and resurrection by testifying firsthand about Him (even to the point of death, our English word martyr) . A T Robertson - In Luke 24:48 Jesus calls the disciples "witnesses to these things" (objective genitive). (1) A witness must have seen that about which he or she seeks to bear witness. (2) A witness must tell others what he or she has seen. A witness is one who gives testimony to an event, person or circumstance. So a witness is one who has seen something, experienced something, heard something. For 3 ½ years these apostles had lived intimately with the Savior and now as a result of their contact with the Holy Spirit and His provision of power they are going to be totally different people. Up until now the apostles have been living primarily in their own strength and the results have not been too impressive! Now they are going to be the Savior's witnesses in the power of the Spirit! Witnesses (3144) (martus/martys) basically describes one who remembers something and testifies concerning what they remember. Notice that martus has a two fold meaning of (1) describing one who has seen and/or experienced something or someone and (2) one who testifies to what he or she saw. The testimony could be in a legal setting (Mk 14:63; Acts 6:13; 7:58; Heb. 10:28) or in the general sense of recounting firsthand knowledge (Lk 11:48; 1Ti. 6:12; Heb 12:1; 1Pe 5:1). A martus is one who attests to a fact or event, one who gives evidence (testifies in a court to the truth of a fact or event), one who has seen or has personal knowledge of something or someone, especially as an "eye witness" (eg, the apostles in Acts having and relating their personal knowledge of Jesus' post-resurrection appearances). A witness is one who furnishes evidence or proof, confirming the truth by verbal testimony. A witness gives testimony in a court trial (Mt 26:65, Mk 14:63, false = Acts 6:13). Scripture repeatedly refers to the Old Testament "formula" of witnesses to some event using the phrase "two or three witnesses" (Mt 18:16, 2Cor 13:1, 1Ti 5:19, Heb 10:28) The witnesses of Hebrews 11 are those whose lives speak of the reality of their faith in God (Heb 12:1). Timothy's good confession before witnesses-they authenticate his confession, Paul's teaching before witnesses - they authenticate his teaching. There were eye witnesses of Stephen's stoning (Acts 7:58) who saw and could tell how he was stoned to death. Martus is used of God as witness (Acts 5:32 = Holy Spirit, Ro 1:9, 2Cor 1:23, Php 1:8, 1Th 2:5, 10). Paul uses this statement somewhat as a "formula" to add validation to what he is saying. In other words, he is saying God saw this and would give testimony that this is what I said or is what I did. Witness is also used of the Holy Spirit (Acts 5:32) and Jesus (Rev 1:5, Rev 3:14). Refers generally to something or someone that bears testimony to things seen, heard, transacted, or experienced. The bearing of testimony can be either passive (as when one is present as a spectator or bystander—Gen. 21:30; Ruth 4:7; Heb. 12:1) or active (as when one gives evidence as a witness). The conventional meaning and usage pertains to the legal sphere but can also refer to the moral sphere. Bearing witness may also denote the content and/or the significance of the testimony. Additionally, a witness (testimony) may refer to facts about which a person is firmly convinced by faith and for which that person would willingly die. In this last sense such a person would be referred to as a martyr. The distinction between witness (marturion, marturia) and martyr (martus) consists only in the degree of their testimony, since both words are cognates of the same Greek verb meaning, “I testify/bear witness” (martureo). What is a witness? The light we need here is light that we have by our common use of the Anglicized form of this Greek word “martyr.” “Ye shall be martyrs.” I do not wish to suggest that Jesus meant necessarily that these men would all die for Him. We have come to use that word “martyr” as referring only to such as seal their testimony with their blood. I am not suggesting that we should abandon that particular use of the word, for it is a great and glorious use of the word to-day. The men who sealed their testimony with their blood were martyrs, but they were martyrs before they died. Smithfield’s fires never made martyrs: they revealed martyrs. Persecution never makes a martyr: it finds him out and wraps him in the glory of flame that we may see him for evermore. Martus - found 35x in 35v (NAS) - Translated - witness(12), witnesses(23). Matthew 18:16 "But if he does not listen to you, take one or two more with you, so that BY THE MOUTH OF TWO OR THREE WITNESSES EVERY FACT MAY BE CONFIRMED. Eerdman's Dictionary of the Bible comments: One who helps establish the truthfulness of a matter by testifying firsthand about what was seen or heard. The necessity of recollecting and reiterating what happened implies that witness bearing includes a historical dimension. Although this activity originated in legal contexts, its vocabulary (Greek - martus/martys) quickly expanded to other social and religious settings. The Mosaic law ensured truthfulness by requiring two or three witnesses to convict a person of a criminal offense and obligating them to lead in the execution of capital sentences (Dt. 17:6–7). Furthermore, it made bearing false witness punishable by lex talionis (Dt. 19:15–19). Mark 14:63 Tearing his clothes, the high priest said, "What further need do we have of witnesses? Luke 11:48 "So you are witnesses and approve the deeds of your fathers; because it was they who killed them, and you build their tombs. Luke 24:48 "You are witnesses of these things. Acts 1:22 beginning with the baptism of John until the day that He was taken up from us-- one of these must become a witness with us of His resurrection." Acts 7:58 When they had driven him out of the city, they began stoning him; and the witnesses laid aside their robes at the feet of a young man named Saul. Acts 13:31 and for many days He appeared to those who came up with Him from Galilee to Jerusalem, the very ones who are now His witnesses to the people. 2 Corinthians 1:23 But I call God as witness to my soul, that to spare you I did not come again to Corinth. Philippians 1:8-note For God is my witness, how I long for you all with the affection of Christ Jesus. 1 Timothy 5:19 Do not receive an accusation against an elder except on the basis of two or three witnesses. 2 Timothy 2:2-note The things which you have heard from me in the presence of many witnesses, entrust these to faithful men who will be able to teach others also. Hebrews 10:28-note Anyone who has set aside the Law of Moses dies without mercy on the testimony of two or three witnesses. Wuest comments: The heroes of faith of 11:4–40 are the cloud of witnesses, testifying to the efficacy of the faith way of salvation and victory. The writer calls them, so to speak, to the witness stand to bear testimony to what they have seen and heard and felt as to what faith could and did do for them, so that this first century Jew might become convinced that the salvation which Messiah wrought out on the Cross, must be appropriated by faith, not works. Revelation 2:13-note 'I know where you dwell, where Satan's throne is; and you hold fast My name, and did not deny My faith even in the days of Antipas, My witness, My faithful one, who was killed among you, where Satan dwells. Revelation 11:3-note "And I will grant authority to my two witnesses, and they will prophesy for twelve hundred and sixty days, clothed in sackcloth." Revelation 17:6-note And I saw the woman drunk with the blood of the saints, and with the blood of the witnesses of Jesus. When I saw her, I wondered greatly. Martus/martys - 45x in the non-apocryphal Septuagint - Gen 31:44, 47; Exod 23:1; Lev 5:1; Num 5:13; 23:18; 35:30; Deut 17:6f; 19:15f, 18; Josh 24:22; Ruth 4:9, 10, 11; 1 Sam 12:5f; 20:23, 42; 1 Kgs 17:20; Job 16:19; Ps 27:12; 35:11; 89:37; Pr 6:19; 12:17, 19; 14:5, 25; 19:5, 9; 21:28; 24:28; Isa 8:2; 43:9, 10, 12; 44:8; Jer 29:23; 32:10, 25, 44; 42:5; Mal 3:5. Isaiah 43:10 "You are My witnesses (martus/martys)," declares the LORD, "And My servant whom I have chosen, So that you may know and believe Me And understand that I am He. Before Me there was no God formed, And there will be none after Me. Isaiah 43:12 "It is I who have declared and saved and proclaimed, And there was no strange god among you; So you are My witnesses (martus/martys)," declares the LORD, "And I am God. Isaiah 44:8 'Do not tremble and do not be afraid; Have I not long since announced it to you and declared it? And you are My witnesses (martus/martys). Is there any God besides Me, Or is there any other Rock? I know of none.'" Comment: In each of these passages God is speaking to Israel calling them His witnesses (martus). Some commentators feel that the in the very fact of their exile, Israel was evidence that God is truly God. Certainly God had predicted their exile to Babylon and its coming to pass was testimony that Jehovah alone is God for only God could predict the future. Thomas Constable for example writes that "God had told them that they would return from captivity as well as go into it. When they did return, they would be able to witness to the world that the Lord had predicted and performed both events." witness must be in the Holy Spirit. Without the gift and presence of the Holy Spirit our witness is bound to be a failure and a disappointment. Let none of us be content with a lower spiritual experience than God is willing to give us. As long as we keep our witness within the bounds of what we can obviously succeed in, we shall accomplish little, but when in abandonment of self, and in reliance on the Holy Spirit, we attempt great things for God, our success will exceed our highest hopes. There has come to you some bit of a call to service, to teach a class, or to write a special letter, or speak a word, or take up something needing to be done. And you hesitate. You think that you cannot. You are not fit, you think; not qualified. The thing to do is to do it. If the call is clear, go ahead. Need is one of the strong calling voices of God. It is always safe to respond. Put out your foot in the answering swing, even though you cannot see clearly the place to put it down. God attends to that part. Power comes as we go. Acts 12:25-28:31 Paul as a witness "to the remotest part of the earth"
"The Acts themselves form the best commentary on these words, and the words themselves might be given as the best summary of the Acts" (Page). The events follow this outline (Jerusalem till the end of Acts 7, with the martyrdom of Stephen, the scattering of the saints through Judea and Samaria in Acts 8, the conversion of Saul, Acts 9, the spread of the gospel to Romans in Caesarea by Peter (Acts 10), to Greeks in Antioch (Acts 11), finally Paul's world tours and arrest and arrival in Rome (Acts 11 to 28). Jerusalem - Also known as Salem, Ariel, Jebus, the "city of God," the "holy city," Zion, "City of David,". This is the most important city in the Bible, the specific name Jerusalem occurring 810 times in 762 verses in the NASB (1977). Judea - In New Testament times Judea designated the southern portion of Israel, south of Samaria, and comprising land from what had been the tribes of Judah, Benjamin, Dan, Simeon, and part of Ephraim. had been commanded to avoid Samaria (Matthew 10:5), but now it is included in the world program as already outlined on the mountain in Galilee (Mt 28:19; Mk 16:15). Jesus is on Olivet (Mount of Olives just east of Temple Mount and the Old City of Jerusalem) as he points to Jerusalem, Judea, Samaria, the uttermost (Greek = eschatos = last, compare "eschatology" the study of last things, i.e., prophecy) part of the earth. The program still beckons us on to world conquest for Christ. Comment: In the Septuagint translation of this verse the phrase "to the end of the earth" is identical to the Greek phrase in Acts 1:8. It is as if in the Isaiah passage the Father gives this charge to His Son and in Acts the Son gives the charge to His disciples. Is notable that the apostle Paul applied Isaiah 49:6 to his ministry to the Gentiles in Acts 13:47 (Paul's First Missionary Journey). Spurgeon's devotional "And ye shall be witnesses unto me." In order to learn how to discharge your duty as a witness for Christ, look at His example. He is always witnessing: by the well of Samaria, or in the Temple of Jerusalem: by the lake of Gennesaret, or on the mountain's brow. He is witnessing night and day; His mighty prayers are as vocal to God as His daily services. He witnesses under all circumstances; Scribes and Pharisees cannot shut His mouth; even before Pilate He witnesses a good confession. He witnesses so clearly, and distinctly that there is no mistake in Him. Be you as the brook wherein you may see every stone at the bottom-not as the muddy creek, of which you only see the surface-but clear and transparent, so that your heart's love to God and man may be visible to all. You need not say, "I am true:" Be true. Boast not of integrity, but be upright. So shall your testimony be such that men cannot help seeing it. Never, for fear of feeble man, restrain your witness. Your lips have been warmed with a coal from off the altar; let them speak as like heaven-touched lips should do. and in the evening withhold not thine hand." Watch not the clouds, consult not the wind-in season and out of season witness for the Saviour, and if it shall come to pass that for Christ's sake and the Gospel's you shall endure suffering in any shape, shrink not, but rejoice in the honour thus conferred upon you, that you are counted worthy to suffer with your Lord; and joy also in this-that your sufferings, your losses, and persecutions shall make you a platform, from which the more vigorously and with greater power you shall witness for Christ Jesus. and be filled with his Spirit. Remember that you need much teaching, much upholding, much grace, and much humility, if your witnessing is to be to your Master's glory. Let me state at the outset what I believe to be the church's greatest need, and I do so without fear of contradiction by any serious, discerning observer. The greatest need and one of deepest importance is for the continual manifestation of the power of the Holy Spirit. I did not say theological theory about the Holy Spirit, or just intellectual understanding -- I said, the power of the Holy Spirit; that has to do with experience not words. When we begin thinking and studying what the Bible has to say about the Holy Spirit and the believer, we are immediately into experimental awareness. I am talking about that which makes men aware of and sure of the reality of Jesus--the Living Christ. Many preachers have little or nothing to say about experimental awareness of God. Not much is heard in our churches about the anointing through which men are made sure of the reality of Jesus as proclaimed by the apostles. 1Jn 2:20,27 is what I am talking about: "But you have an anointing from the Holy One...But the anointing which you have received from Him abides in you." The Holy Spirit is a live subject on the contemporary scene, and many of the qualified people are not saying enough about Him. And some unqualified people are often saying too much and often saying many inaccurate things which sometimes leads to fanaticism and hypocrisy. There are few subjects more important to the Christian and the Christian minister because the Holy Spirit is the source of all spiritual life, all spiritual worship, all spiritual ordinances, all spiritual witnessing and all spiritual service; He is also the "Divine Agent of Evangelism." The Holy Spirit is to the life of the Christian what the Creator is to the world. Without God the Creator the world would not exist and without His continuing, sustaining, and preserving work the world would crash out of existence. So likewise, without the Holy Spirit there would be no Christians in the world and without His continual sanctifying influence the Christian would know no spiritual growth or power. The churches of the reformation gave much emphasis to the work of the Holy Spirit. The reformers stressed that what is necessary for correct interpretation of the Bible is not the church, but rather the illuminating work of the Holy Spirit on man's mind. One of the most effectual ways for a church to revive herself is to preach much about the Holy Spirit; after all He is the very breath of the church. And when a church, a minister or a Christian finds that it is winter time in his soul they must turn to the Holy Spirit and cry, "Quicken Thou me in the Way." May that be our cry these days of the great need for reality in our lives and the life of the church. Luther and Calvin set forth with clarity that it is the Holy Spirit that is necessary in applying the sacrifice of Christ in our lives--not the mass but the Spirit. How many churches are seeking: The power of the Spirit. The wisdom of the Spirit. The grace of the Spirit. The love of the Spirit. To pray in the Spirit? I am not talking about some second experience subsequent to conversion. I am talking about seeking to experience the filling of the Spirit over and over and over again for Gospel purposes. In Romans 15:13,19 the great apostle shows the absolute necessity of the work of the Spirit for the internal growth of the church and for all the outside work of gathering God's elect from the world. In Ro 15:13 he attributes the power to be filled with joy and peace and abound in hope to the Holy Spirit. "Now may the God of hope fill you with all joy and peace in believing that you may abound in hope by the power of the Holy Spirit" (NKJV). "in mighty signs and wonders by the power of the Spirit of God, so that from Jerusalem and round about to Illyricum I have fully preached the gospel of Christ" (NKJV). You see, my dear reader, that first of all, to keep the church happy and holy within herself there must be a manifestation of the power of the Spirit. Secondly, in order for the church to invade the territories of the enemy and conquer sinners for Christ she must be clothed with the same mighty power. And let me underscore one thing, that is, the power of the church for her external work will be proportionate with the power which dwells within herself. What I am saying is this: gauge the power of the Holy Spirit in the hearts of believers and you may fairly judge their influence on unbelievers. Let the church be illuminated by the Holy Spirit and she will be sure to reflect light and power to the unbelieving world. Why?? Because we, ourselves, must first drink of the living water before the rivers of living water will flow to the unconverted. (Jn 7:37, 38, 39) We cannot distribute loaves and fishes out of an empty basket. of the power of the Holy Spirit! When we were baptized we were baptized in the name of the Father and of the Son and of the Holy Ghost. When we pronounce couples "man and wife" we do so in the name of the Father, Son and Holy Ghost. When we affirm our faith in the creed, we say that we believe in God the Father, and in God the Son and in God the Holy Ghost. Yes, and the last words pronounced over our coffin before the mourners turn from our grave and the cold earth goes over our dead body, the last words to the mourners will be, "the grace of the Lord Jesus Christ, and the love of God and the fellowship of the Holy Ghost be with you." When we think of the incarnation we immediately think of the virgin Mary and how the Holy Ghost came upon her and the power of the Highest overshadowed her (Luke 1:35). When we consider the earthly ministry of our Lord we remember before that ministry began the Spirit "descended from heaven like a dove and abode upon him." The Bible says that God anointed Him with the Holy Ghost; again, that the Father gave Him the Spirit above measure and that He was "full of the Holy Spirit" (John 1:32; Acts 10:38; John 3:34; Luke 4:1). When the Scripture takes us to the Cross, where He suffered vicariously, we learn in Heb 9:14 that it was "through the eternal Spirit He offered Himself without spot to God. " When we think of the keystone of Christian truth, the seal and topstone of all His work (the resurrection), the Scripture again underscores the absolute necessity of the work of the Spirit. It is written that "He was put to death in the flesh, but quickened by the Spirit." When we view His departure from this world and the tremendous pain and sorrow that filled His disciples--how did He comfort that little orphan family? Well, it was with that gracious promise that He gave to them the night before He died: "I will pray the Father and He shall give you another Comforter, even the Spirit of truth." And when we think of His final mandate to the apostles to preach the gospel to all the world we again see the necessary place of the Holy Spirit. Hear His own words to them. "Wait for the promise of the Father." They were unfit to go forth with His message until they were "filled with the Holy Ghost." And we too are unfit. What do you think of the whole dispensation under which we Christians live? You know we are privileged far above the Jews in that we are told in 2Cor 3:8 that we live under the "ministration of the Spirit." Why do I say this is the need of the hour? 1.Without the Spirit there will be no conviction. 2.Without the Spirit there will be no conversions. 3.Without the Spirit there will be no Spiritual growth. 4.Without the Spirit all preaching and witnessing is in vain. 5.Even the preaching of our Lord did not produce one convert apart from this life-giving power, though He Himself had the Spirit without measure. The Bible says, "You shall receive power." When? When the Holy Spirit shall come upon you." (Acts 1:8) When we think of evangelism we think of the Holy Spirit promised in Acts 1:8. Immediately our minds run to two things. First, to Pentecost where 3000 souls were evangelized, and secondly, to the effectual call that (1) enlightened their minds, (2) convicted, and convinced their consciences, and (3) renewed their wills. Well, my dear reader, I trust that you can understand my assertion that the greatest need in the church today is a manifestation of the power of the Holy Spirit. Pentecost was a Holy Spirit event--an evangelistic event. When the Holy Spirit came at Pentecost God laid the whole world in the lap of the church as her responsibility to witness. Just think what the Holy Spirit produced at Pentecost. I hear someone saying, "tongues." Well, we will see that tongues is the least thing it produced--almost insignificant by comparison. First, the Holy Spirit at Pentecost produced powerful, evangelistic preaching. See it immediately in Acts 2:14-36. This preaching was not only powerful but it was relevant; it made them ask the right questions. One of the things that serious preachers must always be concerned about is that their preaching be relevant. There is much preaching which is answering questions that no one is asking. That is like scratching where it doesn't itch. One of the fundamental problems of our generation, both in the world and in the church, is that people are not asking the right questions. They are not itching in the right place. Well, what is the answer to that problem? The answer is Spirit-breathed, Christ-centered, Bible preaching in the power and unction of the Holy Spirit. Only the Spirit can bring conviction. The New Testament and the history of revival clearly testify to that fact. John 16:8: "And when he is come, he will reprove the world of sin, and of righteousness, and of judgment." Under the powerful Holy Ghost preaching there is never any problem with people itching in the wrong places, and they will be asking the right questions (Acts 2:37). "What must I do to be saved?" Did any one ever ask a more important question? N.B. (Note well) They did not ask any questions about tongues or anything about the phenomena. They asked a much more important question--verse 37: "Men and brethren what must we do?" Some think of Pentecost as producing tongues. It did that, but tongues did not produce converts. No. It was the powerful preaching induced by the Holy Spirit that made people itch in the right place, ask the right questions, and find the right answers. This powerful preaching produced converts, thousands of them. If you never understand tongues it will not make one bit of difference. But if you never experience Spirit-anointed preaching it makes all the difference in the world--yes, the difference between life and death, heaven and hell. The second thing the Holy Spirit produced at Pentecost was an "Apostolic Church." See Acts 2:42-47. The Holy Spirit is not just an "Evangelist" drawing people to Christ. The Holy Spirit is also a "Church Planter" and a "Church Builder." The Holy Spirit draws people into the fellowship of the church. The Holy Spirit creates the communion of obedient, teachable, worshiping, and witnessing Christians. Christians who are learning to love God, love God's people, and God's Church. What is an Apostolic church? It is a church experiencing the power of the Holy Spirit. This is apparent by what is revealed in Acts 2:42-47. The converts were steadfast. "They continued steadfastly." That is, they were not a church that was carried away with every novelty and every new gimmick or method of evangelism. An apostolic church knows what it believes and why it believes what it believes. There are four areas or four distinct marks of an apostolic church set forth in these verses. 1. (Acts 2:42) - They were continually devoting themselves to Apostolic teaching. Perhaps this is the primary mark. A real church will be submitting to apostolic truth. They will be interested in what the Bible says, what it means and how it applies to faith and practice. "All is vain unless the Holy One come down." No ordinance has any effective spiritual power except the Spirit gives it. No Christian's heart is ever in the proper frame to worship without the Holy Spirit. The presence of the Holy Spirit in the worship of God issues in joy and gladness. They were distinguished by God-honoring worship. 3. (Acts 2:44, 45) - They were marked by Christ-like love and unity. They did not forsake the assembling of themselves together. 4. (Acts 2:47) - They not only applied themselves to sound doctrine, and engaged in true worship, and were united by Christ-like love, but fourthly, they were increased by God-centered evangelism. The Lord added to the church. That is God-centered evangelism. Did they just sit under apostolic teaching, worship and pray, and say the Lord saves? No, there was something else going on daily. Cf. Acts 2:47. Every day or day by day the Lord added because every day...from house to house they kept teaching and preaching about Jesus. Acts 5:42 (NKJV): "And daily in the temple, and in every house, they did not cease teaching and preaching Jesus as the Christ." This was God-centered, Holy Ghost, God-honoring evangelism. The Father has sent us the Comforter that He may dwell in us till the coming of the Lord. The Holy Ghost has never returned, for He came in accordance with the Saviour's prayer and the Saviour's promise, to abide with us forever. The gift of the Comforter was not temporary, and the display of His power was not to be once seen and never again. The Holy Ghost is here and we ought to expect His divine working among us; and if He does not so work we should search ourselves to see what it is that hinders, and whether there may not be somewhat in ourselves which vexes Him, so that He restrains His sacred energy, and does not work among us as He did before. As Jesus' parting Gift is near each pleading company. But here in present majesty, as in His courts on high. He reigns with absolute control, as monarch in the breast. O Lord of life, our hopes fulfill, and bless this hallowed hour. What we long for supremely is to be empowered by the Holy Spirit--to know the fulness of the Spirit. Organization is helpful, but one thing is essential and that is the power of the Spirit. 1.Our organization will be filled with power, peace and prosperity. 2.Our orthodoxy will pulsate with love. There will be no legalism or Pharisaism. Our liberty will serve the interests of truth and godliness, not self-indulgence. 3.A fuller tide of the Spirit means spiritual discernment, deeper insight into the Scriptures. 4.The church will be "glorious in holiness," for wherever the Spirit of God dwells He is as the refiner's fire. 5.Peace, harmony, and unity will be insured. Fidelity to truth will carry no pride or bitterness. 6.The church will have a real missionary vision. 7. With the fulness of the Spirit the church will not use carnal and unworthy methods in worship or witness. Whatever means you use to get people into the church is precisely what you must use to keep them. If you get them with a religious circus then you must keep the circus going--keep up the entertainment. If you get them with biblical preaching and teaching, then that will keep them and you will not need the entertainment. The church will have an attractive power. When the fruit of the Spirit abounds men will be drawn as bees to the apple blossom. Preaching will be "in the demonstration of the Spirit and power." But I think I hear someone say, "O, that was an apostolic promise, you are talking about apostolic times." No, my friend, I am speaking to you about something that not only happened in the far distant past, I am speaking about a promise that is far-reaching, yes, the promise of the Spirit is a far-reaching promise. Let me give you just two verses to establish that fact. Acts 2:38,39 (NKJV): "Then Peter said to them, 'Repent, and let every one of you be baptized in the name of Jesus Christ for the remission of sins, and you shall receive the gift of the Holy Spirit. For the promise is to you and to your children, and to all who are afar off, as many as the Lord our God will call.'" Please note the words "to all who are afar off." If those words are not sufficient to convince you then underscore the rest of the words in the passage, "as many as the Lord our God will call." Oh, I am glad for this "far-reaching promise." Do you realize that all that has been done by God the Father and all that has been done by God the Son will not accomplish one thing unless the Spirit makes them effectual? Surely this is the greatest need in the church. No acceptable action of the Christian life can be performed without the Holy Spirit. The Power or Fullness of the Spirit? The Bible makes two things very, very clear in connection with fullness and power of the Spirit. First, there is some relationship between the fullness and power of the Spirit and prayer. Two passages underscore this statement. Luke 11:13 (NKJV): "If you then, being evil, know how to give good gifts to your children, how much more will your heavenly Father give the Holy Spirit to those who ask Him!" Acts 4:31 (NKJV): "And when they had prayed (and not before) the place was shaken where they were assembled together; and they were filled with the Holy Ghost, and they spake the word of God with boldness." The Holy Ghost does not flow through methods but through men. He does not come on machinery but on men. He does not anoint plans but men. It is not great talent nor great learning that God needs but men great in holiness, great in faith, great in love, great in fidelity, great for God. These men can mold a generation for God. Secondly, the Bible also teaches that there is some relationship to the power of the Spirit and obedience. Acts 5:32 (NKJV): "And we are His witnesses to these things, and so also is the Holy Spirit whom God has given to those who obey Him. " Our Lord condemned the religious crowd in His day on two counts (Mt. 22:29). He said to them, "You do err [or you are mistaken], not knowing the scriptures nor the power of God." They lacked knowledge and power. When the disciples could not heal the man in the gospels it was not a lack of knowledge but power. We do not lack knowledge--we lack power. Power comes by prayer and fasting. It is possible to know the plan (knowledge) and not know the power. You will not get power by attending meetings even though you may get the principle for receiving the power by the meeting; you will get the power by waiting on God. You may get the inspiration to seek the power in the meeting, but the power itself comes by waiting, not going. 1. Everything that grieves the Spirit must be put away. To use biblical language "all malice and all guile and all hypocrisies and all unbelief, worldly mindedness, pride" --everything opposed to the simplicity, the charity and purity of Christ. "And I say to you, ask, and it will be given to you; seek, and you will find; knock, and it will be opened to you. For everyone who asks receives, and he who seeks finds, and to him who knocks it will be opened. If a son asks for bread from any father among you will he give him a stone? Or if he asks for a fish, will he give him a serpent instead of a fish? Or if he asks for an egg, will he offer him a scorpion? If you then, being evil, know how to give good gifts to your children, how much more will your heavenly Father give the Holy Spirit to those who ask Him?" This kind of prayer links together the whole communion of the faithful and knows no stopping till the answer comes. We cannot stop at mere theological consideration of the Holy Spirit. Why? Because sound theology without the Spirit will make you dry up. The Spirit without sound theology will make you blow up. But with both sound theology and the Spirit you will grow up. My whole motive and effort in this article is to create within us a genuine desire for the power of the Spirit in our ministry and in our places of service. The old Latin hymn of the 10th century expressed it well. May it be the desire of our hearts. May shine immortal strength prevail. Illustration - No, this isn’t a Seinfeld episode—it is real life. The U.S. Postal Service in a surprise audit discovered that some local managers temporarily stashed unprocessed mail in parked trailers so that the letters and packages so supervisors wouldn't notice it as delayed. Auditors found millions of pieces of undelivered mail, including 2.3 million bulk-business letters, some of which were delayed nine days, and 800,000 first-class letters, which had been held for three days. What should the penalty be when the people entrusted with the news fail to make the delivery? The world may not be expecting the delivery, but they are at home awaiting the message of the good news concerning God sending His Son. We must be faithful to deliver the message. Acts 1:8 (NKJV) But you shall receive power when the Holy Spirit has come upon you; and you shall be witnesses to Me in Jerusalem, and in all Judea and Samaria, and to the end of the earth. Jesus said about the people of His day, "You are mistaken (Greek = planao) because you do not know the Scriptures or the power (Greek = dunamis) of God." (Mark 12:24) Are you mistaken dear child of God? Ignorance is not bliss when it comes to a true knowledge of the Holy Spirit. Rob Morgan in his discussion of how "The Holy Spirit Works through Us" tells a story that literally changed the course of Billy Graham's ministry - ....In our Christian work and in our personal ministry, it is the Holy Spirit Who works through us. Jesus told the disciples in Acts 1:8: “You will receive power when the Holy Spirit comes upon you, and you will be my witnesses….” If you ever want to pursue an interesting personal Bible study, just read the book of Acts and underline or highlight every reference to the Holy Spirit. You could make a strong case that the book of the Acts of the Apostles ought to be called the Acts of the Holy Spirit. In the book, The Leadership Secrets of Billy Graham, Harold Myra and Marshall Shelly said that when Billy Graham was a young man he accepted every speaking engagement that came his way, and he was full of passion as he preached the Gospel and invited people to receive Christ as their Savior. But there was still something missing, and he knew that his personal charisma was not enough to fulfill the calling of God on his life. During a preaching mission to the British Isles, he met a young Welsh evangelist named Stephen Olford who had the spiritual qualities that Billy longed to have. (Ed note: Graham called him "the man who most influenced my ministry.") One day Billy listened as Olford preached on the subject of being filled with the Holy Spirit. “You’ve spoken of something that I don’t have,” said Billy. I want the fullness of the Holy spirit in my life, too.” Olford agreed to set two days aside during Billy’s campaign. During the day the two men talked and at night the paused long enough for Billy to preach. In a small stone hotel, Olford led Billy step by step through the Bible verses on the power of the Holy Spirit. The first night when Billy preached, Olford thought that his sermon was ordinary and not particularly effective. The next day Olford continued the instruction, telling Billy that he must be broken like the apostle Paul, letting God turn him inside out. Olford shared his own testimony, and Billy’s eyes filled with tears. “Stephen, I see it,” he said, “That’s what I want. That’s what I need in my life.” They knelt, and Billy poured out his heart in a prayer of total dedication to the Lord. And finally he said, “My heart is so flooded with the Holy Spirit! I have it! (Ed: Better "I have Him") I’m filled. This is a turning point in my life.” The two men went on to the meeting where Billy was to preach and for reasons known only to God, the place which was only moderately filled the night before was packed to the door. When Billy gave the invitation, practically the entire crowd rushed forward. And it was, indeed, a turning point in his ministry. Now we’re obviously not all evangelists like that, but we all need the power and the anointing of the Holy Spirit, and the work that we do for Christ is nothing except the work that Jesus Christ Himself is doing through us. My grandfather ran a waterwheel beside a small creek in Roan Mountain, Tennessee. He ground corn into cornmeal for his own family and for others. The water hit the wheel, and that turned the mechanism that did the work. It would have been very difficult work if my grandfather had tried to turn that wheel in his own power. But it was the power of the perpetually flowing water that turned the wheel and produced the results. You say, how do I experience the fullness and the power of the Holy Spirit? • Confess and turn from all of your sins, including those sins that so easily beset you. • Open every part of your life to Him in full yieldedness and surrender. • Pray and ask God for His fullness. John 4:35 (NKJV) "Do you not say, 'There are still four months and then comes the harvest'? Behold, I say to you, lift up your eyes and look at the fields, for they are already white for harvest! When God allows difficult circumstances in our lives—a lost job, a demanding family need, a relocation to another city, state, or country—can we see His hand and sense His power? May we be like those early Christians, accepting the Lord’s leading and joyfully proclaiming His Word wherever we are. That was the challenge Steve Jobs issued in 1983 to John Sculley, then president of Pepsi-Cola. Mr. Jobs was the creative genius behind Apple Computer. He knew that the soft-drink executive could help Apple make its mark on the computer world. Sculley accepted the bold challenge. Jesus issued a challenge to three fishermen as they tended their nets. He commanded, “Follow Me!” (Mk. 1:17). They did, and with a handful of other ordinary men they changed the world. On the Day of Pentecost the promised Holy Spirit began a new work through them, and 3,000 were saved (Acts 2). Eventually critics would charge that they had turned the world “upside down” (Acts 17:6). Our world is wrong-side up and right-side down, living by principles opposed to our Lord’s teachings. We can either follow the world’s dead-end philosophies, or we can accept Jesus’ challenge to bring change to the world. My joy you'll find as You obey." A disciple is known not for what he gives up, but for what he takes up. Have We Learned? - What happens when we keep to ourselves something that, if shared with others, would enrich their lives? We not only fail to increase their happiness, but we rob ourselves of the joy that generosity brings. Luigi Tarisio, who loved violins passionately, never learned that lesson. He spent his limited income buying the finest instruments he could find. He owned 246 exquisite violins, which were crammed into every corner of his otherwise barren little house. And they were never played! His obsession prevented those instruments from bringing pleasure and inspiration to other music lovers. Instead of following Luigi’s example, we need to be motivated by the admonition of Proverbs 3:27 to keep ourselves free from the guilt of withholding good. Even more, we should be motivated by grateful obedience to Jesus Christ. And obedience, the Savior assures us, brings joy (John 15:10-11). As Christians, we have a message that makes the melodies of heaven flood our souls. Our Lord gave us the mandate to share that message with everybody everywhere (Mark 16:15). Are we keeping the heavenly harmonies of saving grace sealed up inside ourselves, or are we obediently letting them ring out through our lips and lives? Joy is a byproduct of obedience. Lesson Of The 18-Wheeler - I was talking with a veteran truck driver about his life on the road. We discussed interstates, cities, truck stops, engines, and tractors. As he spoke about his huge rig, he referred several times to steering axles and drive axles. I asked him to explain the difference. He told me that the front axle of a truck is the steering axle. The drive axles, located under the rear of the cab, transfer the power that is generated by the diesel engine. It’s the drive axles that enable the semi to climb steep grades, inch down dangerous slopes, and barrel down the highway to get the load in on time. My discussion with that trucker gave me a new appreciation for those 18-wheelers, and it reminded me of a spiritual truth. Just as steering axles and drive axles are essential to a tractor-trailer, so also direction and power are vital to followers of Christ as we travel through life. The Holy Spirit provides us with both. He was sent to guide us into all truth (Jn. 16:13) and to teach us (1 Cor. 2:10-16). We are empowered by the Spirit to witness (Acts 1:8), to pray (Rom. 8:26), and to live a hope-filled life (15:13). Direction in God's holy Word. comes from the Spirit inside us. Power Failure - I felt mechanically illiterate. I was struggling with a videocassette player for a study group at church and couldn’t make it work. Fortunately, someone saw my plight. I stood there appreciatively as he sized up the situation—and then plugged the power cord into the wall outlet. Why hadn’t I thought of that? I was so preoccupied with patch cords and monitors that I overlooked the obvious. I forgot about the power. If I looked foolish there, it’s nothing compared to what the angels see as they observe me. They must be astounded by my efforts to make life work without God’s power. I join them in sad wonder. How can I forget that the infinite, personal Spirit of Christ lives within me to guide my life and give me power? The answer is regretfully clear. There’s a loose cord somewhere. When I am preoccupied with pleasing myself, I miss the power that comes from a healthy relationship with Christ. His Spirit enables me to do the will of God, to show His attitudes, and to fulfill His purpose. But I have to stay plugged in through prayer, reflection on God’s Word, and complete reliance on His power—not my own. Renewed in strength for victory. is like an unplugged power cord. Let the Whole World Hear! - Fritz Kreisler (1875-1962), the world-famous violinist, earned a fortune with his concerts and compositions, but he generously gave most of it away. So, when he discovered an exquisite violin on one of his trips, he wasn’t able to buy it. That all He gave me He’ll give to you. Someone told you about Christ. The Missionary Option - There are two kinds of people when it comes to missions—those who need to share Christ and those who need to hear about Him. As a boy I looked up to missionaries as godly people who sailed to some far-off, uncivilized land and didn’t return for several years. Being a missionary was the ultimate calling—nothing could be more noble or admirable. I still believe that God calls men and women to missionary service in other lands, and I still have great respect for them, but my idea of missionaries has changed. Every Christian is part of Christ’s mission in the world. What Jesus told His disciples in Acts 1 applies also to us. We are His witnesses and therefore must speak and live so that others will glorify Him when they hear our message and see our faith in action. I'll tell the world of Thee. Home Missions - One morning as I was strolling along the shore of the Gulf of Mexico, I saw a middle-aged man sitting in the water. We exchanged greetings, and then he painfully struggled to his feet and began to talk. What a story of angry resentment! As a young man, he was about to set up a law practice when he was called into the armed forces during World War II. While in the military, he contracted a disease that left him maimed in body and bitter in soul. Lord, give a zeal compelling. or have we lost our burden? Witnesses - In a criminal court case, witnesses provide vital information about a possible crime. Being a witness means telling the court the truth about what you know. Just as the criminal justice system relies heavily on witnesses, Jesus uses bold, faithful, and credible witnesses to spread His Word and build His church. Before Jesus ascended to His Father, He gave His disciples a final command—to launch a worldwide witnessing campaign. The Holy Spirit would come upon them and give them supernatural power to be His witnesses throughout the world (Acts 1:8). Jesus called these early apostles to go into a world where people did not know about Him and to give a truthful account of what they had seen, heard, and experienced (Acts 4:19-20). Since they had witnessed His perfect life, teachings, suffering, death, burial, and resurrection (Luke 24:48; Acts 1–5), they were to go out and give a truthful testimony about Him. Always, only, Lord, for Thee. God has left us in the world to witness to the world. He Wanted To - In his book Love Is Now, Peter Gilquist mentioned that he and several other friends were invited to speak to a group of UCLA students. After the meeting, a young man expressed a desire to discuss the matter of salvation. So Gilquist arranged to meet with him the next morning. The student said that he really wanted what he saw in the lives of believers. But he hesitated to make a commitment because he thought he would have to tell others about Jesus. Gilquist, however, assured him that to become a Christian he was not required to do anything but place his trust in Christ. Realizing that salvation is by God’s grace through faith, the student gladly received the Lord Jesus as his Savior. But a strange thing happened as he went back to his fraternity house. He met a friend and told him of his newfound faith in Christ. Before the day was over, he had testified to every one of his fraternity brothers about Jesus. Our witness for Christ should reflect a grateful heart—a sincere desire to share salvation’s blessings with others. If we shrink from giving a word of testimony, let’s ask God to give us the desire to speak out for Him. Then we’ll witness because we want to. you’ll want others to know Him too. The Power Of Pentecost - A pastor I know and love is discouraged. Although he is diligent in prayer and works hard, his church remains small while a new congregation nearby is rapidly developing into a megachurch. Yet when I think of the alcoholics, drug addicts, and sexually immoral people he has led to the Savior and a new way of life, I see him as one who witnesses in the power of the Holy Spirit. Because of what happened on the Day of Pentecost (described in Acts 2), we tend to associate the Holy Spirit’s presence and power with amazing phenomena and large numbers. We forget that a little later the same people filled with the same Holy Spirit were rejected, flogged, imprisoned, even executed. But through it all they were powerful witnesses! The Holy Spirit’s presence and power can be evidenced in a dynamic preacher who attracts great audiences. But it is seen as well in the volunteer who carries on a one-on-one prison ministry, in the person who witnesses to a co-worker or a neighbor, and in the Sunday school teacher who faithfully teaches week after week. The power of Pentecost is not reserved for the highly gifted. It is available to all believers in Christ who want to serve Him. Of power that we can receive. gives power to our witness. one of his very attractive qualities is precisely his ordinariness, his humanity and his limitations. And yet, he became a remarkable evangelist who in his 1875 mission to London alone would preach to two and a half million people. Even his critics agreed that he ‘reduced the population of hell by a million souls’. God surprisingly transformed this humble, ordinary shoe salesman into a preacher who could proclaim the gospel persuasively to peers and paupers, to duchesses and dockers alike. Why was this? How? What made the difference? The answer is the Holy Spirit. No doubt, there were other factors involved. He had, for example, learned through the example of Harry Moorhouse, a Lancashire lad, to preach the love of God rather than to harass people into heaven through the harsh threat of hell. But others knew how to do that without the same effect. D. L. Moody, however, was the one called in God’s sovereign purposes to be the chosen instrument of revival in his day and to be anointed by the Holy Spirit with remarkable power....he exhorts the believers of his own day, and ours, to seek not just the Holy Spirit ‘in’ them but also ‘on’ them. In his sermon, ‘Power—“In” and “Upon” ’ he sets out the need to the church. The greatest lack of the church, (Moody) claims, is a want of power. How could believers see their relatives and neighbours going to eternal ruin and not be concerned to speak to them about Christ? Something, surely, must be wrong with a church like that. Yet, from what he writes it is apparent that not all would agree with him that the problem lay in a lack of power. Many saw the source of the trouble as lying elsewhere. A great many people are thinking we need new measures, that we need new churches, that we need new organs, and that we need new choirs, and all these new things. That is not what the church of God needs today. It is the old power that the Apostles had, which we want; and if we have that in our churches, there will be new life. Then we shall have new ministers, not the same old ministers, renewed with power; filled with the Spirit. Our churches, he said, needed to be irrigated with the Holy Spirit. But, even more particularly, we needed to be ‘artesian wells’. Other pumps demanded pumping, pumping, pumping, as he obviously well remembered. That was hard work, but unproductive. And many ministers appeared to be doing just that in their pulpits. But, oh for a continual flow of God’s grace that did not depend on resorting to such methods. ‘You cannot get water out of a dry well,’ he proclaimed, ‘there must be something in the well, or you cannot get anything out.’ And that was exactly the problem with so much energetic but unanointed activity in the church. All the new measures in Christendom will prove futile, if the well is dry. To waiting, Moody added thirsting as a precondition for the Spirit’s anointing. He asked whether people really wanted the power. ‘The great question before us now is, Do we want it?’ In Moody’s view it was the absence of any serious hunger and thirst for power that prevented the church from experiencing it. They were not committed to seeking it, even if they glibly acknowledged that it would be a good thing to have. He was convinced that if the church genuinely sought power from God they would receive it. We all need it together; and let us rest not day nor night until we possess it. If that is the uppermost thought in our hearts, God will give it to us; He will grant us the blessing, if we just hunger and thirst for it, and say, ‘God helping me, I will not rest until endued with power from on high’. Why should people not want such power? The question remains a pertinent one for the contemporary church. It is one to which there are several answers. First, we often prefer to do things our way rather than God’s. We neither want to give up control, nor status. We are more comfortable in thinking that we should be able to organize a response to the gospel by more conventional, worldly means—like advertising, good publicity, contemporary music, academic argument, entertaining speakers and by getting celebrities to give their testimonies—than in God’s way which, consistent with the cross of Christ, is through weakness. That way we feel much more on a level with the world and we shake off the very thing that the early church took glory in, namely, that they were among the poor, weak, insignificant and powerless in the world. We will demonstrate our power, our cleverness and our importance. But the one thing this will not do is to demonstrate the ‘knowledge of the glory of God in the face of Christ Jesus’ since such an approach is not compatible with his gospel. It will not display the glory of God for we cannot display his glory and our own at the same time. Second, we often want the power but are not prepared to meet the conditions of receiving it. God will not give his power to those who tolerate sin in their lives. Arrogant impatience for power for its own sake and selfish ambition will not yield the desired result. Third, many do not thirst for God with the passion Moody commended lest God should quench their thirst, meet them powerfully in their request and change them. Of one thing Moody was sure. God wanted to bless his people. He wanted to shine on his world, to lift up his work, to give his people power. If we seek his blessing with all our hearts, we will obtain it. The blockage does not lie with God. It lies in the half-hearted desire of his people and their lack of seriousness about the work of God. Is this waiting on God and thirsting for his anointing, once granted, a one-off second blessing, as some would teach? Having experienced it, does it guarantee fruitfulness from then on? Not for Moody. He was aware that we needed to keep on seeking such anointing. We need to keep fresh. The fact is, to use Moody’s typically down-to-earth way of putting it, that when the Holy Spirit comes, he comes to ‘leaky vessels’. We may be filled now, but we lose the Holy Spirit within and ‘we have to keep right under the fountain all the time and so have a fresh supply’. The supply of ten years ago will not do. Because we leak we need to seek the Holy Spirit for today. We are in constant need of fresh power, fresh supplies, fresh anointing. The result of such anointing is that we shall preach Christ and preach him effectively. We will not be talking of self. We shall not exhibit anything of self. We shall be concerned for God and his glory alone. We may wish to argue about the finer points of Moody’s theology. We may want to express things differently than he did. We may not feel as easy about the rigid distinction between power ‘in’ and power ‘upon’ as he was. But the evidence is surely all around that what we desperately need is the power, whatever language we use, and whether ‘in’ or ‘upon’. We need the fresh anointing of the Holy Spirit and Moody challenges us to ask for it. He challenges us as to whether we are going to wait for it, hunger and thirst for it, find it and then seek it again, or not. Without it, all our other activity will have no value.